Posted March 29, 2017 • filed under Research. I am a performance practitioner and researcher, interested in archives, personal collections, and spoken histories. My work is immersive and allows for audience participation through using audience stories as the main focus of the piece presented. It further employs creative technologies and sound art installation to exhibit and present the stories collected during each performance. In this article, I will be concentrating on one of my performance projects called Love Letters; while touring this work I have collected 200 love letters written by audience members. In this article I will describe the diverse narrative/storytelling ‘interfaces’ used in the performance as well as how we aim to redevelop Love Letters by making the costume/dress, used in the piece, a storytelling object that will narrate past audience letters from the collection to present day audiences. 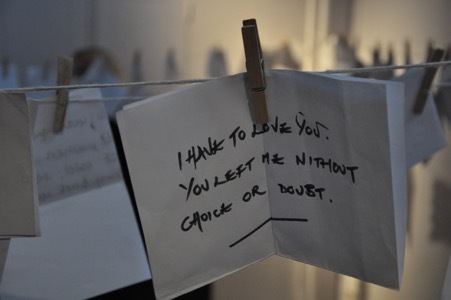 Love Letters at Performance and Live Art Platform, Cyprus (2013). Image by PM. 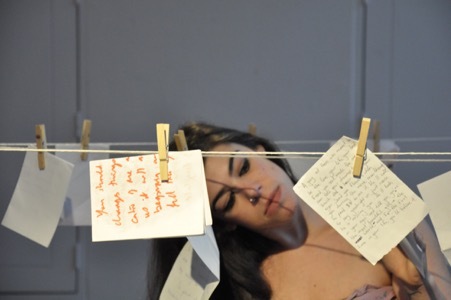 Love Letters is a live, durational performance with a performer wearing an interactive dress, a station for writing love letters, and an installation of letters. It is a performance project that has toured international performance festivals and art-related events since 2012: Performing Documents (2012), Performance and Live Art Platform (2012, 2014), Tempting Failure (2013, 2014), Latitude (2015), and iDocs (2016). Reviews about the piece have been published both in online and print media, in Vice Live Art Almanac Vol. 4 and EXEUNT magazine. 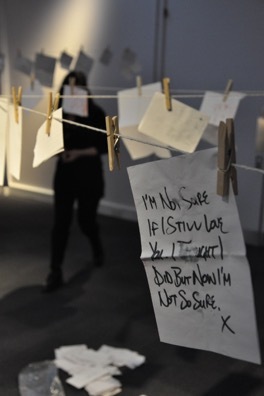 Love Letters at iDocs (2016). Image by OP. The piece invites participating audiences to write letters that capture platonic, familial or lustful emotion, to share other audiences’ letters and to interact with the performer’s costume by attaching the letters to her dress in addition to documenting memories and streams of consciousness onto both the costume and the performer’s body. The collection of letters contains audience love letters about moment in time, letters to old friends, old lovers, family, about falling love, or even love that can never work. At the end of the performance, the dress I wear is full of audience love letters. 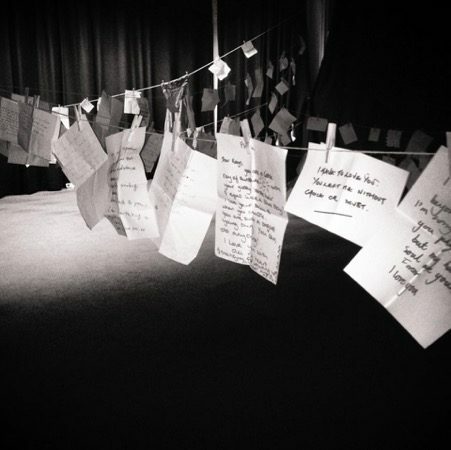 In each performance past audience letters are revisited and new love letters are added to the collection. 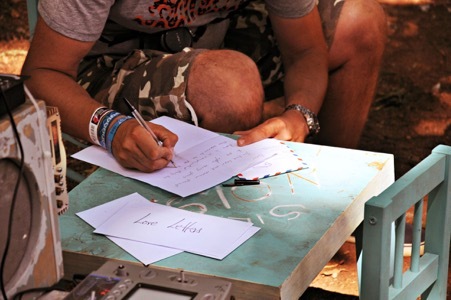 Love Letters at Latitude Festival (2015). Image by MM. Through a collaboration with creative technologists and interdisciplinary artists we aim to redevelop the dress as a storytelling object using creative technologies, as explained below. This will enable us to build upon the audience-led experience of the love letters collection encountered in the performance. I have been living away from ‘home’ for the past 11 years in order to pursue my academic research and artistic practice which includes developing interactive approaches to curating and exhibiting oral histories as well as new ways of storytelling with and for the public. Within this timeframe, I have moved between 3 countries, 4 cities, and 13 houses. The process of unpacking each time is not only mundane but sometimes painful, as I often find myself, as one does, going through boxes and boxes of old photographs, reading strips of paper, dwelling on postcards and letters. This memorabilia – remnants of relationships long past, traces of intimate relationships that no longer exist, recollections of desperate apologies – is too precious to discard. Thus, it ends up hidden in the depths of my wardrobe or roughly preserved in suitcases under my bed. The process of self-archiving – unpacking, reading, labeling and preserving my own collection of love letters and emotional luggage – made me think about how, if I consider my memorabilia important enough to keep, then other people may share similar emotional attachments to such tangible traces. This prompted a further question: is the practice of writing love letters vanishing because of technology? Surely, the love letter hasn’t disappeared, but rather it has been democratised and made commonplace by technology. However, what about the actual ritual, the analogue procedure, the aesthetic, conceptual and emotional value that is found in the very act of handwriting a love letter, the physical artifact that lives on? Does the digital form of the love letter share the same value as its material form? Is it able to capture the emotional registers (anguish, longing and desire) that make the performance of writing love letters so powerful? For Sartre, love letters awaken an affective analogue, a physiological or psychological element that is a constituent of a person’s imaginative state. This is the ideal and subjectified reality or imaginary affection of the lover for the beloved. It is the subjective idea that the lover holds of the recipient of the love letter, which serves as a substitute when the beloved is absent. This emerges from within the person engaged in the physical and conceptual ritual of writing the love letter. For example, at the moment when the beloved becomes absent, the lover’s desire transforms into an irreal object – something produced, not by the beloved’s existing image or presence (beloved-as-real), but by the lover’s idea of them, which is trying to fill in the gaps of their beloved’s presence (beloved-as-imagined). As this irreal object becomes difficult to imagine because of the physical absence between the lover and the beloved, it confirms the lover’s desires. Due to the physical absence, the affection and love between the lovers reverts into a type of ‘deprived’ or empty love, “a love for love’s sake, a love that is in love with nothing other than itself” (Kearney, p.68). In this sense, lover uses their ‘analogon’ to make present to themselves that which is absent, the imagined beloved. The very practice of writing love letters makes this emotional process of a relationship between the lover and the beloved transparent. For both Sartre and Barthes, the lover’s anguish over the beloved’s absence and the longing for their presence is desire, which uses imagination to cover the voids created by an absence. In this sense, it is only the imagination writing love letters to itself, responding to its desire with its own desire. As discussed further on, absence and presence are themes that my performance project, Love Letters, plays with strongly; for the reason the performance employs creative practices that encourage human expression and therefore evoke emotions such as grief and loss. Hence, does typing a love letter, faxing it, emailing it, coding it, posting it, sharing it – have the same effect, even if its purpose is to communicate via written word the same raw emotion of human pathos? Love Letters at Wickham Theatre, 2013. Image by YD. The love letter has been cherished for centuries, written by: Beethoven and Embry, Napoleon to Josephine, Jean Paul Sartre to Simone de Beauvoir; Oscar Wilde to Lord Alfred Douglas, Leo Tolstoy to Valeria Arsenev, Allen Ginsburg to Peter Orlovsky; Frida Kahlo to Diego Rivera, Vita Sackville-West to Virginia Woolf; John Keats to Fanny Brawne, Voltaire to Olympe Dunover, and the list goes on. Throughout history, love letters have taken a biblical tenor, literary forms (early Renaissance, evolving in the Enlightenment), going beyond being written as literary device for romance and affection. Instead emerging into a political act of wisdom, an opportunity for self-reflection and introspection. YOU ARE MY CRAVING FERVOUR, MY PRECIOUS FERVOUR. MY LOVE EAGERLY LUSTS AFTER YOUR LOVING FONDNESS. MY PASSION PINES FOR YOUR ENTHUSIASM. MY SYMPATHY FERVENTLY HOLDS DEAR YOUR HEART. The chaotic remix of sentimental words indicates an ‘ache of longing’ which journeys “beyond the one that already accompanies the genre: one can almost sense M.U.C.’s thirst, as if the computer were struggling to speak from the heart but discovered that its vocabulary had been arbitrarily limited to the language of clichés” (Wardrip-Fruin, 2011). Returning to my initial point, the value and beauty of this ritual of writing a love letter lives in the passionate and intentional desire to capture the message in writing, turning the praxis of writing a love letter into a performance of composition and reflection with the recipient at the heart of this action. The symbolic actions engaging audiences in the performance project, Love Letters, do not only intervene in the idea of keeping memories private by compelling the audience to participate in an exchange of memories, but also creates a second level of intervention by compelling the audience to witness other people doing the same. This is realised by ‘exposing’ their intimate and personal testimonies (with their consent). The audience accounts – composed and narrated during the performance of Love Letters – make evident how narrative is a vital component of the human mind, key to making sense of the world around us. Thus, the collection of these letters acts as a type of candid cultural artefact or resource that carries ‘intangible’ personal heritage – the letters tell stories that are sometimes profound and intense, and at other times superficial and trivial, and are then given existence through their mediation within a performance setting. 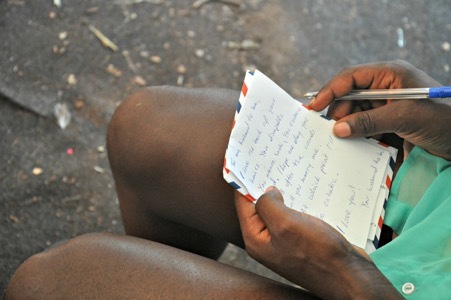 The action of writing a letter is used in the piece as a tool to evoke memories. This is achieved by having the audience engage with the performer by addressing and dressing her in particular ways so that the shared memories become attached with new environments, connotations and other ways of telling. These modes of engagement occur through two strands of audience – performer interaction: (1) writing the letter and reading an other letter aloud; (2) pinning the narrated letter onto the dress and writing on the dress and on the performer’s body, which in the performance act as narrative interfaces. The dress worn in every performance is the same. It is ‘stained’ with past and present audiences’ contributions, playing with the notions of presence and absence. As described, the audience makes notes on the garment and or the performer’s body, ‘memo’-type messages left on it, for others to see and perhaps to not see. In consideration of this, the dress/the costume used in the performance is a crucial component of the piece. It becomes part of the audiences’ recollections, not only for its traces of past written and narrative acts, but also as an in-between, a mediator, of what was said and what was lost. It most importantly becomes a vessel that embodies audience members’ intimate stories. The dress witnesses the different tellings and shares a different type of intimacy with each and every audience member who has interacted with it. It is a technology that is physically embedded with their memories, as well as the cultural connotations it carries because of its material form. Further research has posed new questions for the project: what if the performance’s dress narrated letters written by its past audiences, as a response to its interaction with present audiences? To explore this I put together an interdisciplinary team of creatives, including artistic practitioners and technologists with experience of developing interactive technologies for storytelling and immersive performance purposes. Together we aim to concentrate on redeveloping the letter writing engagement and technological interactions of the dress, making it a storytelling object or device. To achieve this we plan to create a technological speaking attachment to the dress using electronics and by augmenting the dress with recordings of the existing collection of letters. This will allow it to speak its past audiences’ letters to present-day audiences, as part of a narrative exchange in the performance. Following the original live performance process – writing love letters, depositing these in the space, reading other letters aloud and attaching these to the dress – the audience’s engagement with the costume will trigger a reaction where the dress narrates another story from the collection as a response. The dress will become an interactive storytelling object and a type of ‘worn’ sound installation, which will give the audience a further creative agency and shared ownership over their letters and the entire collection. The primary importance is not the technology itself but the pervasive effect it has on the storytelling process. This work makes use of technology, whilst offering audiences agency/ownership allowing for creative expression and imagination, while not drawing the attention away from the performance and storytelling aspects of the piece. To undertake this project we recently launched a crowdfunding campaign. We need the public’s support to redevelop this piece. Our aim is to raise enough funds to develop the technology for the piece to build on an audience-led experience of sharing memories. 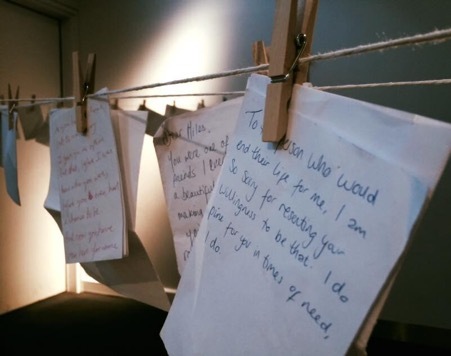 We have planned two public events to showcase this work: in the UK at Centrespace Gallery (Bristol) and in Zagreb at the Museum of Broken Relationships (Croatia), where we intend to donate the entire audience love letters for collection once the project is completed. 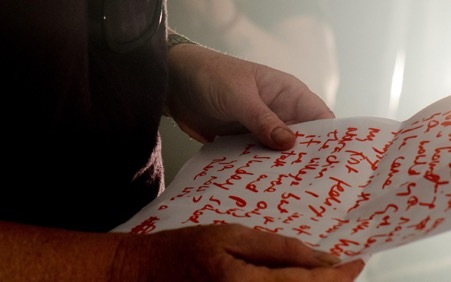 It is important to us that the letters audiences have entrusted us with in each performance are preserved in a safe and loving space, for other people to read and appreciate. You can check out our pitch here: https://spsr.me/FxkW. We appreciate any kind of support, If you don’t feel like contributing financially, maybe you would like to send us a love letter instead. Send love letters (addressed to a significant other) to p.demetriou@gmail.com, subject line “love letter donation”. Barthes, R., (1977), A Lover’s Discourse, (London: Random House, New ed. 2002). Demetriou, P. A., Pappas, O. and Kampylis, S., (2017) “Love Letters: Wearing Stories Told – a performance-technology provocation for interactive storytelling”, Body, Space & Technology Journal, 16. ISSN 1470-9120, <http://people.brunel.ac.uk/bst/vol16/>. Kearney, R., (2006), Poetics of Imagining, (New York: Fordham University Press). Link, D., (2016), Archaeology of Algorithmic Artefacts, (Minnesota: Univocal Publishing). com, (2017), Love Letter generator, [online] Available at: <http://www.gingerbeardman.com/loveletter/> [Accessed 13 Mar. 2017]. Sartre, J., Elkaïm-Sartre, A., Webber, J., (2004), The Imaginary, (London: Routledge): 145. Wardrip-Fruin, N., (2011) “Digital Media Archaeologies: Interpreting Computational Processes,” Media Archaeology: Approaches, Applications, and Implications, eds. Erkki Huhtamo and Jussi Parikka (Berkeley: University of California Press): 302-322. Dr Panayiota Demetriou/Yiota (PhD, UoB) is the PDRA for research centre Making Books: Creative Writing and the Digital, at Bath Spa University, where she also lectures in Performance Studies and Cultural Geography. She is a Live Art practitioner, performance art photographer and initiator of Performance & Live Art Platform Cyprus.